With Friends off the air for about ten years now, and How I Met Your Mother also kaput, the big question is whether The Big Bang Theory is going to fill the void. Some people think it's an obvious choice, with characters who live in close proximity to one another and spend seemingly every day together. But, the series is not as Everyman as the older comedies; University scientists are much more difficult to relate to than teachers, businessmen, and lawyers. And, Pasadena is certainly not New York... not that you'd know that's where TBBT takes place, as the program rarely leaves its standard sets. The humor and situations are also a far cry from those in the more "classic" sitcoms. 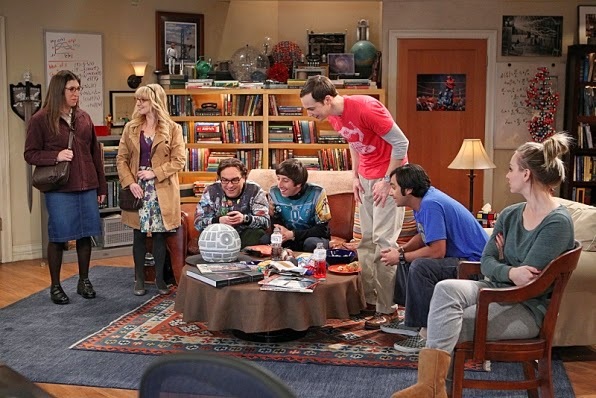 But, at the same time, Big Bang utilizes more popular culture references and jokes, and focuses more on single situations than ongoing arcs, at least to a certain degree. Do you think that the characters illustrating how deep their feelings go for one another helps this point?